AC: "on any given day, in war, it's all about a matter of inches." 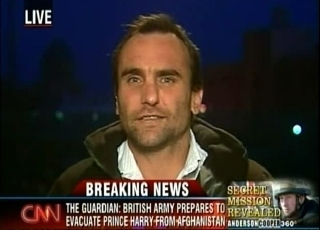 Soledad O'Brien asks Michael (and Nic Robertson) to comment on Prince Harry being pulled out of Afghanistan due to yesterday's internet gossip report revealing he was there. 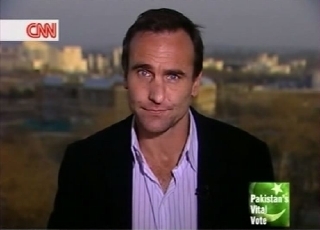 AC: ...a bunch of galahs, a bunch of drongos..."
Michael comments on the leak that revealed that Britain's Prince Harry has been serving in Afghanistan for the past ten weeks, while Nic Robertson shows some interview footage shot there by a pool reporter. 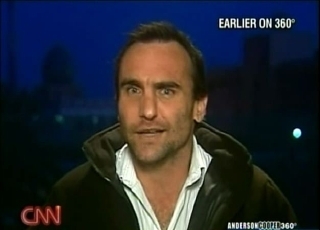 During the interview, Michael used some Aussie slang to describe the Australian gossip magazine that first ran the rumor and Matt Drudge's gossip site that first 'went large' with the story; in a second clip, Anderson gives the translation, garnered from fans on the blog and a quick phone call to producer Tommy Evans in Baghdad. 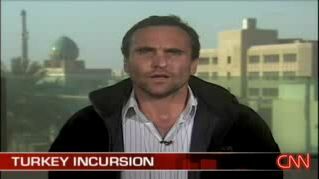 AC: "It's all completely underwritten by the presence of more than 100,000 U.S. troops keeping everybody apart." Michael delivers an incredible summation of the results of the surge and how there is no way that we can pull the troops out now. This is the clip that all the presidential candidates need to watch and address. Women and children were among the victims in a suicide bombing in Iraq which killed up to 40 people. The attack focused on Shiite pilgrims travelling to a major religious ceremony south of Baghdad. There are now fears this could revive the cycle of sectarian violence. The suicide bombing also coincides with mounting tensions in Northern Iraq after Turkish troops crossed the border to hunt down Kurdish separatists. 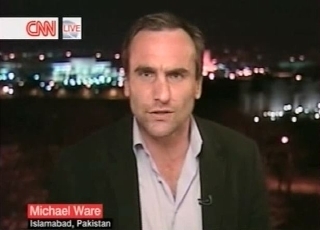 Michael is back at the Baghdad bureau, and does a recorded report about Turkey's latest incursion into Kurdistan. 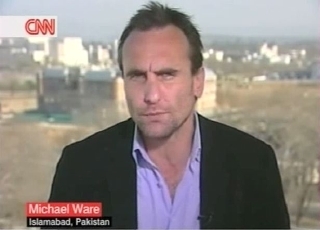 Michael hosts a round-up of today's coverage, which includes an update from Reza Sayeh and a broadband interview with Jennifer Eccleston in Karachi. The polls have just closed, although results are not expected for several hours. 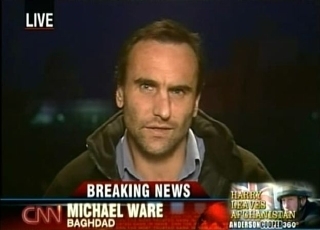 Michael recaps the events of the day -- not as much violence as had been expected/feared, but several deaths did occur. AAM: "If the fix is in, it's already in." 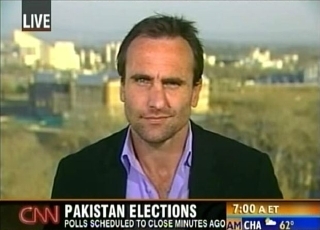 Michael reports from Islamabad during the final hours of voting. Not a lot of violence -- certainly less than most people expected -- but as Michael says, if the fix is in, it was in long before today. And the mere expectation of that may trigger violent reaction as the results are announced hours or days from now. 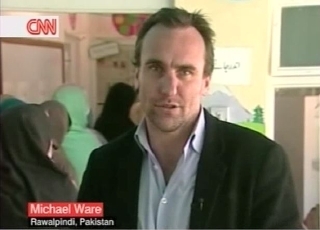 Michael makes a brief appearance from a polling place in Rawalpindi as elections are underway in Pakistan. 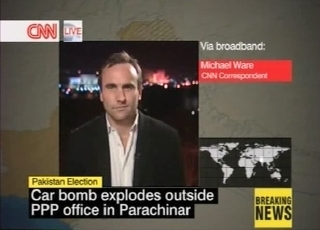 Michael appears by broadband to report on a bombing in Pakistan. The special, in three parts. 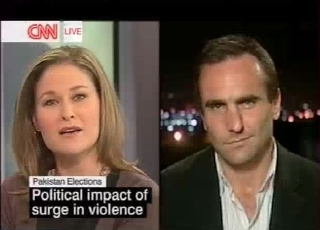 The first has a recap of recent political events in Pakistan and includes a piece from Jennifer Eccleston. 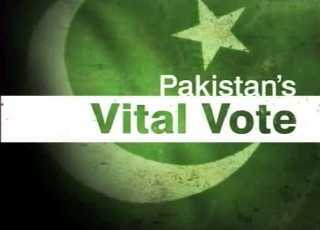 In the second, Michael interviews a Pakistani journalist and a politician regarding whether the elections can be "free and fair." 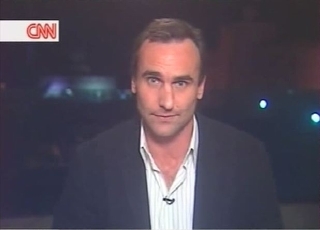 And the final segment highlights why this election is so important for the rest of the world, with background from and interview with Peter Bergen. 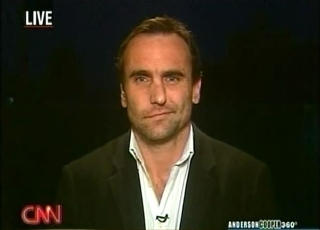 Michael appeared on the International version of Your World Today this morning, to discuss Monday's election. 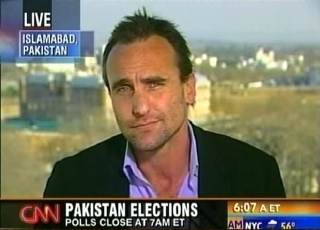 Promo for "Pakistan's Vital Vote"
The promo running on CNN/International for this weekend's special -- which Michael is hosting -- about the Pakistan elections.